Excellently organised by the Société Royale Saint-Hubert (Belgian canine organisation), the European Cup for Spaniels (on shot game) has just taken place on January 25-26, 2014 in very mild weather conditions. The first day was held on the hunting terrains surrounding the Castle of La Motte, where the judges were staying : 1 French, 1 Italian, 1 Dutch and 3 Belgians ; the second day took place on the hunting grounds of the Castle of Heks, just a few kilometres further. These terrains were graciously made available by their owners thanks to the initiative of the Belgian Springer Club. The nature of the grounds was a perfect biotope for Spaniels to hunt. Spaniels are, by definition, dogs hunting in bushes: undergrowth, marshy areas, covered with brambles, shrubs and reeds. This is a place where you can find a natural fauna - which is quite exceptional nowadays – comprising woodcocks, pheasants, hares and rabbits. Four nations - the Netherlands, Italy, France and Belgium - were represented by 4-dog teams (Cockers and/or other varieties). 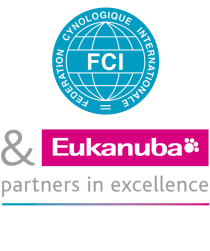 Let’s hope that in the future, the German-speaking and Scandinavian countries will also adopt the FCI A-regulations; their dogs are welcome any time. In Cockers, the Cup was won by the Netherlands, followed by France and Italy; Belgium had no team to propose; in the individual ranking, the Cocker “Gallia d’Hurtevent » (France), handled by M. Paque, was the winner. Belgium won the Cup “Other Spaniel Varieties” – by the way, all were English Springer Spaniels – with Italy as runner-up and the Netherlands being 3rd. In the individual ranking, the Springer “Marea de la Banda Allata” (Italy), handled by Mr Barbanera, ended up in the lead, followed by two Springers from Belgium. Nowadays, the English Springer Spaniel is undoubtedly, together with the Retrievers for the beat, the most popular breed among small game hunters in Belgium.